Now that I reached 100 posts on my dutch recipe blog, I also want to translate some and add them to the english version. This recipe comes from a book where all the recipes have maximum 6 ingredients. Surprising in this recipe is the combination of tomatoes and wodka in a main course. And not just a little bit of wodka, half a liter of wodka! You can make it with 0,5 liter, but I make it with 0,5 deciliter, which is more correct I guess. Boil the plum tomatoes for 1 minute, and then peel them. Cut them small and remove the seeds. Cut the olives into small pieces. Cut the garlic clove into fine pieces. Heat a pan with tablespoons of olive oil. Add half of the tomatoes and let them cook for 10-15 minutes. Add pepper and salt as you wish. Put the tomato sauce aside. Cook the penne al dente and put it aside as well. Now heat the pan again with the remaining olive oil. Stir-fry the garlic for about 2 minutes and then add the remaining tomatoes. Let them fry for 2 minutes and then add the wodka. Add the tomato sauce and let it cook for 6-8 minutes, until the alcohol has evaporated. 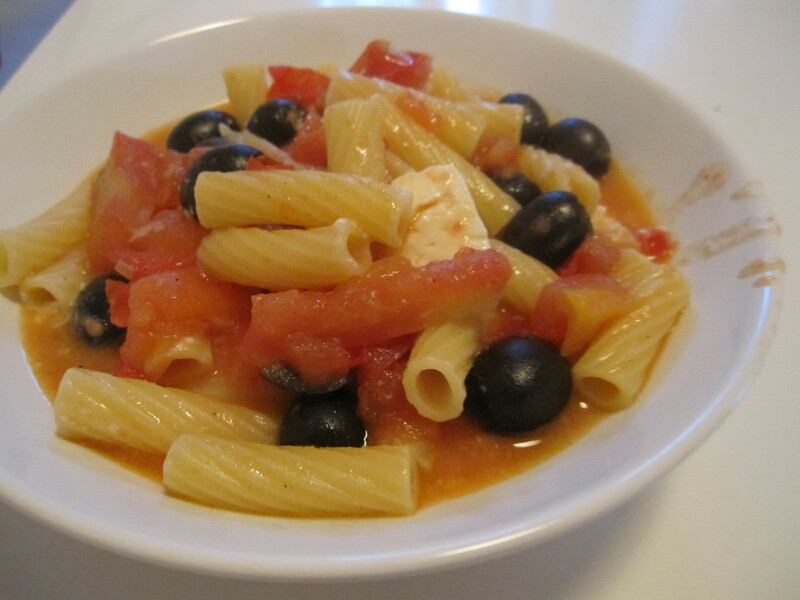 Now add the penne, the olives and the feta cheese and stir well. When they have warmed up, you can serve immediately.